We recommend checking out our discussion threads on the Kyocera / Yashica YAC-300 Action Camera with Wi-Fi YAC-300, which address similar problems with connecting and setting up Sports & Action Cameras Kyocera / Yashica. The user manual for the Kyocera / Yashica YAC-300 Action Camera with Wi-Fi YAC-300 provides necessary instructions for the proper use of the product Camcorders - Sports & Action Cameras. 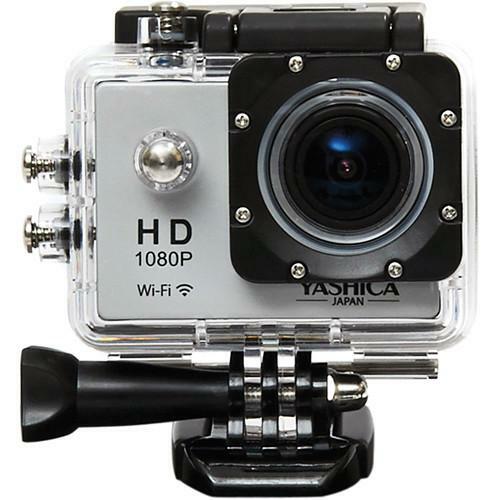 The silver YAC-300 Action Camera with Wi-Fi from Yashica records 1080p video at 30 fps, takes up to 12MP interpolated still photos, and features built-in Wi-Fi connectivity for remote monitoring and control via the iSmart DV App. Included with the camera is a waterproof housing rated to depths of 100', making the camera suitable for underwater snorkeling and diving activities. Also included with the camera is an assortment of mounts to cover a variety of shooting situations, with mounts provided for helmets, handlebars, tripods, and more. A 1.5" LCD screen on the back of the camera allows you to compose your shots as well as review what you've already recorded. The camera records to microSD/SDHC memory cards up to 32GB in capacity. In addition to 1080p at 30 fps, the camera can also record 720p at 60 fps. A micro HDMI port allows you to connect directly to an HDTV to view your recorded content, while a micro-USB port allows you to transfer footage to a computer for editing. The USB port is also used to charge the included 900mAh lithium-ion battery. On a full charge, the battery provides approximately 90 minutes of continuous use. If you own a Kyocera / Yashica sports & action cameras and have a user manual in electronic form, you can upload it to this website using the link on the right side of the screen. Box Dimensions (LxWxH) 8.583 x 4.173 x 2.992"
The user manual for the Kyocera / Yashica YAC-300 Action Camera with Wi-Fi YAC-300 can be downloaded in .pdf format if it did not come with your new sports & action cameras, although the seller is required to supply one. It is also quite common that customers throw out the user manual with the box, or put the CD away somewhere and then can’t find it. That’s why we and other Kyocera / Yashica users keep a unique electronic library for Kyocera / Yashica sports & action camerass, where you can use our link to download the user manual for the Kyocera / Yashica YAC-300 Action Camera with Wi-Fi YAC-300. The user manual lists all of the functions of the Kyocera / Yashica YAC-300 Action Camera with Wi-Fi YAC-300, all the basic and advanced features and tells you how to use the sports & action cameras. The manual also provides troubleshooting for common problems. Even greater detail is provided by the service manual, which is not typically shipped with the product, but which can often be downloaded from Kyocera / Yashica service. If you want to help expand our database, you can upload a link to this website to download a user manual or service manual, ideally in .pdf format. These pages are created by you – users of the Kyocera / Yashica YAC-300 Action Camera with Wi-Fi YAC-300. User manuals are also available on the Kyocera / Yashica website under Camcorders - Sports & Action Cameras. Please teach me how to connect my camera to my smartphone/ my computer? Please send me a copy of the manual. Thanks.